The SMART Board 600i interactive whiteboard system offers you greater flexibility in the classroom. It combines an award-winning SMART Board interactive whiteboard, a EB-670 Ultra Short Throw projector. Besides offering extraordinary features at an affordable price, the 600i enables you to easily access and control your classroom technology, including the projector and other peripheral devices, right from the front of your classroom. The EB-670 ensure high quality images with equally high White and Colour light output for vivid colours and bright images, even in daylight. HDMI input means that students benefit from sharp, clear images. SMART Learning Suite software includes: SMART Notebook, SMART lesson activity builder and SMART amp which is a cloudbased software using Google Apps for education to take student led learning to a new level. Students and teachers, both inside and outside of school, can collaborate at the same time across any laptop or tablet. Warranty: Get a 3-year warranty on the EB-670 Ultra Short Throw projector. 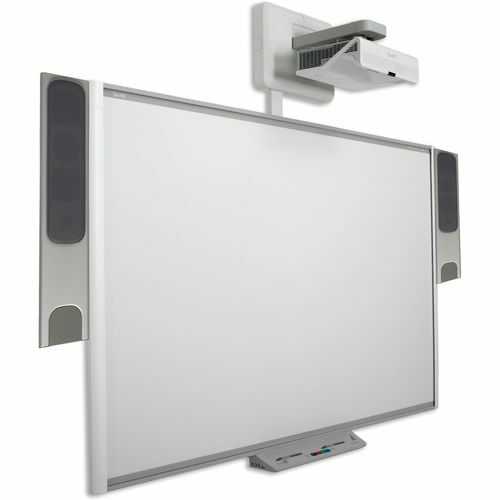 The SMART Board interactive whiteboard has a 2-year warranty, which is extended to 5 years upon product registration.